Cakes Delivery to Beirut and Lebanon. This delicious vanilla cake is topped with fresh strawberries. Standard size (Serves 12pax) as shown in photo. You have the choice to upgrade the cake size to 22pax as well as to specify the flavor you like. Order should be placed 1 day ahead of delivery date. 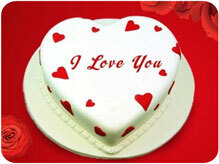 Use Gifts n Flowers Lebanon online store to send cakes to Lebanon and Beirut. 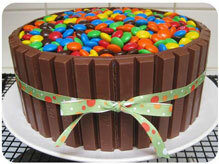 Surprise your beloved in Lebanon by sending them a chocolate Kit-Kat Barrel cake topped in multi-colored Smarties. Order should be placed 1 day ahead of delivery date. Send something sweet for your sweetie in Lebanon, since love knows no distance. A perfect gift on Valentine's Day or other romance occasion. Standard size (Serves 12pax) as shown in photo. 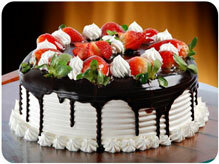 You have the choice to upgrade the cake size to 22pax as well as to specify the flavor you like. Add a personal touch to your cake today. 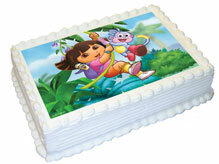 Personalize your cartoons character edible photo cake by providing us with any of your favorite cartoons character photo to be added on cake as shown in photo. Standard size (Serves 12pax), you have the choice to upgrade the cake size to 22pax. Thank you Lebanese Sweets for Karbouj Assabeh in Pistachios...lets just say I am a customer for life!!! Nabil Awad. I would like to thank you lebanese-sweets for the best sweets ever, my boyfriend enjoyed and loved the way it looked and taste! You will always hear from me. Rita Najjar. I recommend Lebanese Sweets. Their professionalism helped to deliver my order of Arabic Sweets delivery to Lebanon a wonderful success on Mothers Day. I absolutely use them in the future. I absolutely delighted with the service from GiftsnFlowersLebanon.com. The recipient was really happy. I highly recommend your services for sweets and balloons delivery to lebanon.